Everyone has something worthwhile to say. Mushmouth isn’t easy to comprehend, but he’s got friends who pay attention when he does. It usually isn’t words of wisdom he’s speaking, but because they love him his friends listen. Everyone has a talent. Mushmouth is one of the gang’s musicians, playing a homemade bass guitar. He shows that there are other ways to express oneself apart from speaking. Children with speech impediments especially can learn from Mushmouth. Patience with those with speech problems. 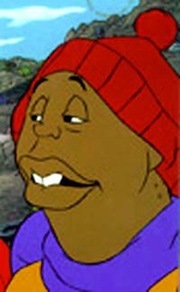 The producers of the show themselves limited the lines and scripts they provided for the character Mushmouth, not wanting to slow down the show. It’s a valuable lesson in patience and tolerance for kids who know other kids with similar challenges. Teamwork means working with, and around, one another’s weaknesses. Mushmouth has to give stage directions for a movie the gang is filming, and it tests everyone’s patience. The gang holds true to their friendship as well as their commitment to teamwork. For every weakness there is a strength. Mushmouth doesn’t say much because of his speech problem, and that makes him a better listener than most. He offsets one disadvantage with a very useful asset. A lesson for kids in developing their listening skills. When you speak, make it count. Mushmouth tends to make the most of his chances when he does choose to say something. It may not be profound, and sure won’t be easy to understand; but Mushmouth will say something relevant to the moment, whatever it may be. It’s rude to talk while chewing gum. Unfortunately, Mushmouth can’t use this as an excuse for speaking the way he does, but he does provide a good example of what you would sound like with a mouthful of bubble gum. So spit it out first before talking to your elders. Real friends make an effort to understand us. In any other crowd, Mushmouth might have been an outcast, but the Cosby Kids are willing to listen to – and decipher – what he’s got on his mind. There’s genuine love and kindness in that simple act. Teasing or bullying is a terrible thing to do. Too often, kids like Mushmouth are easy targets for abuse and ridicule. Characters like Mushmouth give us a great opportunity to gauge our kids’ reaction to people that are a bit different and talk to them about how they should be treated.